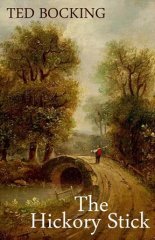 In January 1840, 19 year old Barnaby Madden becomes a constable with the new Norfolk County Constabulary, having been given just three days’ instruction and then sent on his way. Surviving the Blitz, an inconspicuous grammar school education and a bemused service in army Intelligence make for an odd background for an author. Remnants of Ted Bocking's great grandfather’s scribbled notes formed the basis of the Barnaby Madden books - The Hickory Stick and The Ashen Rung. One of those books your friends will be happy to hear about. A fascinating read. Highly recommended.